hi there,my computer wont boot up,just a green blinking light,but when i disconnect the 24 pin lead from the mother board the green light stops blinking and stays green,when i plug the 24 pin lead back into the mother board the computer boots up ok.When the computer is switched off overnight the green blinking light returns. Hi stellabelly sorry to hear you are having problems with your PC. You need to provide information about your computer, this includes is it a custom build or brand name such as Dell or HP, if it is provide the model name or series number, motherboard , PSU and any add on card details would also help others to help you better. My first suspicion is a flaky PSU provide us with the requested details and it may help shed more light on the possible cause. NB: Can you confirm that you are not plugging or unplugging connections whilst the power is on. Thankyou for your information phillpower2,yes that is the correct machine,but before i try another psu there is another problem,the computer boots up with a bleeping noise with nothing showing on the screen,is the problem still the psu or the motherboard? As you have no display one may think that the video card had failed but unfortunately if the PSU is not putting out enough power you will not get a display. Check out the beep codes and post back but I have a feeling you may have to open the case and check out the video card, I will help you with this if required. 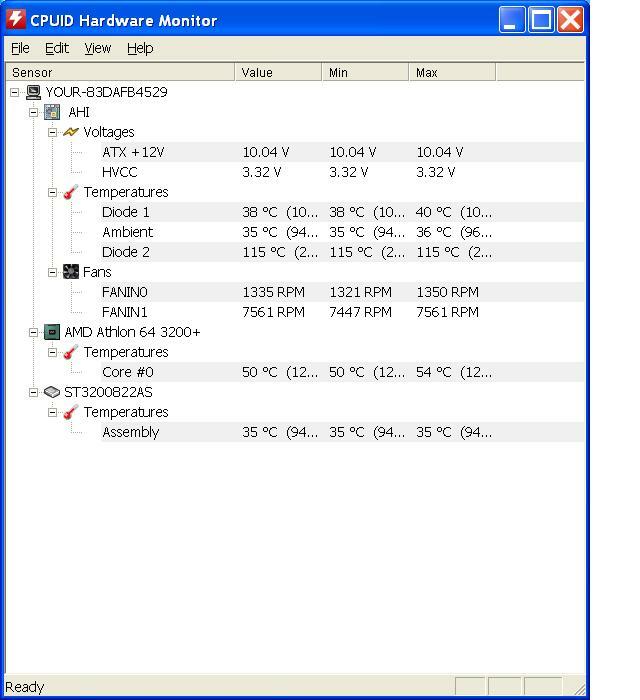 Hi phillpower2,dont know bios manufacturer but the computer bleeps every 3 seconds if you can help me. The following checks require the computer case to be opened so take the following safety precautions 1st, disconnect the power cord from the wall and take anti static precautions before touching anything inside, you can do this by touching a bare metal part of the case. Remove the video card, blow out the slot and then re-seat the card securely, do the same with the Ram sticks. While the case is open the opportunity should be taken to clean out any heat trapping dust, clean all fans, if canned compressed air is used do not allow fans to spin freely use something like a clean lollipop stick to hold them still and finally make sure that all connections are secure and avoid upending the can as fluid can be emitted. Hopefully one of the above will resolve the issue but if not try another video card. Removed video card and ram sticks and cleaned out the dust,connected power and the green blinking light had returned,so disconnected 24 pin lead to mother board while power still connected,green power light then stop blinking and reconnected 24 pin lead to mother board,and the computer booted up with no bleeping noise. You should never connect or disconnect any power to a computer whilst it is live, at best you can fry the system at worst you can fry yourself. This again suggests a power issue be it the PSU itself (most likely) or the 24 pin connection (less likely). If the issue happens again with all power disconnected please closely inspect the 24 pin plug from the PSU and the 24 pin socket on the MB, any signs of damage, loose MB socket or wires in the 24 pin plug. Hi phillpower,thankyou for your information,yes i was plugging connection while the power is still on,but like you said i think the problem is the psu because the computer will boot up if the psu is in standby mode(green light stays on),but if you turn off the computer at the wall sockets the psu from a cold start,after many hours,will result back to the blinking green light.Would you suggest leaving the computer always on standby mode,or replace psu. Would you suggest leaving the computer always on standby mode,or replace psu. 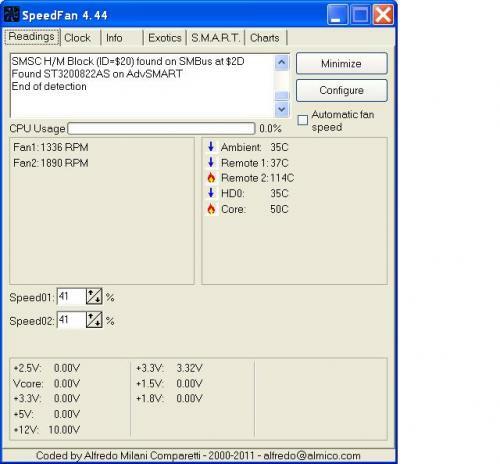 Without a doubt replace the PSU, if it is faulty it can pop at any moment and take the rest of your system with it. Download Speedfan and install it. Once it's installed, run the program and post here the information it shows. The information I want you to post is the stuff that is circled in the example picture I have attached.If you are running on a vista machine, please go to where you installed the program and run the program as administrator. then after typing in any response you have... click on browse...desktop...find the screenshot..select it and click on the upload button...then on the lower left...after it says upload successful...click on add reply like you normally would. hi phillpower2 here is the screenshot. Couple of the readings are off there namely the non existent +5V, the +12V reading 10V and the temp readings. 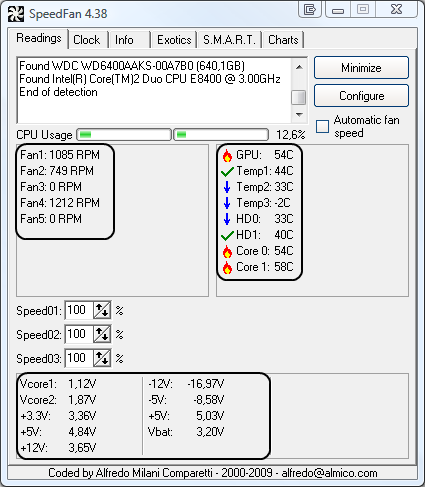 Download and run HWMonitor http://www.cpuid.com.../hwmonitor.html again post a screenshot, feel free to uninstall Speedfan now.